Not gonna lie, this hero sounds cool. A Phase Shift that, even as a meme, is a helpful support bonus. Is the Medkit only visible if we check our map? I like the concept, but I think it’s a little too underpowered. I think Ned has a good chance at beating Thanos. Another good thing about this Outlander is that he will mitigate 100% of the damage taken as long as the Medkit’s not picked up. That’ll make him kinda OP, i’m pretty sure. ngl I avoid this guy when I’m doing missions just for the Daily Quests. I straight just leave him to die despite the fact that he is one of the easiest survivors to get. It’s just the audacity of him to ask for a damn med kit and demand not to be saved unless he has it. 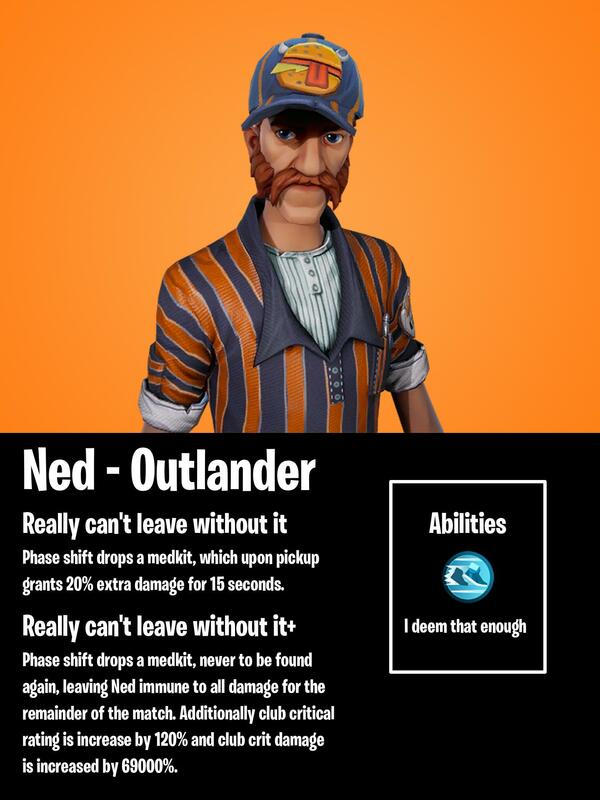 Jokes aside, I’d totally be down for a playable Ned hero. He could have an aoe heal ability, or something. Thank you, I was getting worried. I know it’s a lot to ask… A medkit that makes you deal extra damage?